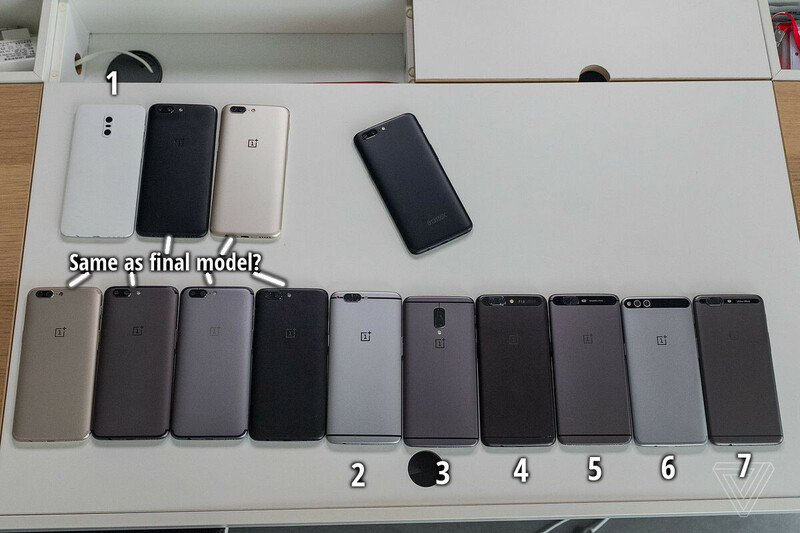 Which of these OnePlus 5 prototypes would you rather have made it to be the final product? It's no secret that phone manufacturers go through lots of prototypes and test a lot of options before deciding on a final design for a product. OnePlus, aspiring to be a serious and competitive phone slinger, naturally did the same. Co-founder Carl Pei said that the OnePlus 5 went through 100 different prototypes. We saw some of them thanks to an exclusive report by The Verge. The writers were shown a bunch of OnePlus 5 designs that didn't make it to be the final product, and took a photo to show them to the world. We can see a lot of different ideas woven in every phone on that table. We've got a classic OnePlus 3 look, just with a dual camera, a model that's inspired by the LG G5 (top left), and some that look like they've borrowed ideas from Huawei's P10 and the Nexus 6P (lower right). Arguably, only a few of them are as... blatant as the OnePlus 5's final form. So, looking at all those metal slabs, which one would you have preferred to be the actual OnePlus 5 phone? Which OnePlus 5 model would you have liked better? I think option 3 is definitely the most original given the camera placement but other than that I think what they went with looks better than all the others even if it looks like an Iphone. Option 3 to me is the most original to their own OnePlus brand design (Which to me was always a mix up of HTC's one line and the ZTE Axon line), but it's looks are very unappealing. Option 1 is the most original, while Option 3 is the most similar to the 3T, but not to any other company's phones. I like 6 the most but it screams p9, and 6p. 1 looks like moto g second generation with camera flash and dimple. 3 is the most original if slightly unappealing. It resembles the 3T which many liked. 1 for sure. Is that like full ceramic? Option 5 looks like a Nexus 6P... Option 3 looks more original to OnePlus' own design language. camera module at the center is the best position. wont get obstructed by fingers. No3 for sure ! So easy to choose actually , op just took easy way obviously . Look close everyone. Option 7 actually looks the best and doesn't look like any other, be it any huawei, apple, htc, Samsung, whatever.